Trips around Zlín Region – where to go? Discover the beauty of eastern Moravia and on a trip to Zlin. In the romatic town, where Tomas Bata was born, but also in its surroundings can be found places that not only pleases your eye, but also your soul. The regional town Zlin is located in the south-eastern part of the Czech Republic and it neighbours with the region of Wallachia, Slovakia, Hana and the Slovak Republic. The pictorial town will enchant you not only with the romantic castle Lesna and Zoo. You can enjoy beautiful evening in Zlin thanks to large cinema that is located here since 1932. Originally Bata´s cinema had capacity over 2500 visitors. And even though it is now “only” about 1000 visitors, it is still one of the largest cinemas in the Czech Republic. You can enjoy romantic experience even in a local observatory, where you can see clearly all the stars. Let yourself be enchanted by the world of animals and visit the ZOO Lesna. In one day you can take a trip around the world and meet with 1163 animals from Africa, Asia, Australia, South and Central America. ZOO Zlin is opened daily all year long. » More information at www.zoolesna.cz. No step without shoes! Visit the Shoe Museum in Zlin and familiarize yourself with the history of footwear. This museum is the oldest museum of its kind in the world! There are concentrated different types of shoes from all continents. » More information at www.muzeum-zlin.cz. Who would not know Bata and his shoes! 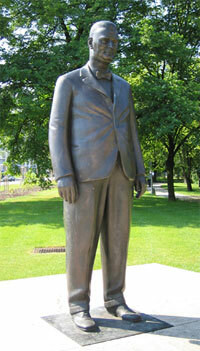 In the Villa of Zlin native, there are regular guided tours about the life and the activities of Tomas Bata. In addition, you can watch original documentary films and original commercials from Bata´s film studios. » More information at www.batova-vila.cz. Enjoy a romatic trip to nearby town Kromeriz. The medieval town hides Archbishop’s palace and beautiful gardens listed in UNESCO World Heritage Site list. Archbishop´s Cellars, Chateau garden and Mint are waiting for you! » More information at www.azz.cz. Up on a deck! Enjoy the romance and adrenalin and come to Bata Canal. You can sail on a cruisers or spend couple of days on a hausbot. » More information at www.batacanal.cz. Go back in time to the mystical medieval times. The origins of the castle has been dating back to the 13th century. The castle was gradually rebuilded so int its architecture can be seen various architectures. Romantic scenery and the surrounding countrysidewill delight fans of history and romance. International Film Festival for children and youth is a perfect relax and distraction on your vacation. Atmosphere full of films and accompanying events entertain not only children, but also adults. » More infromation at www.zlinfest.cz. Do you like fast cars? If yes, you should not miss the annual car rally! Heavy machinery, great atmosphereand a rich accompanying programme guarantee that you will not get bored. » More information at www.barum.rally.cz. Come and taste our local slivovitz! Vizovice fest celebrates the base of this alcohol – plums. The festival has been held since 1967 and its regulat visitor is Wallachian King Bolek Polívka. » More information at www.vizovicketrnkobrani.cz. Metal and rock festival Masters of Rock has been for the long time one of the most popular festivals in the country. Areal of Vizovice has hosted such names as Manowar, Nighwish, Apocalyptica, Sepultura, etc. Do not miss this great event! » More information at www.mastersofrock.cz.